State Insurance in New Zealand has been wooing potential customers with a nationwide search for find out what Kiwis care about most. State Insurance undertakes to find a way to protect these things, the clients’ favourite things. 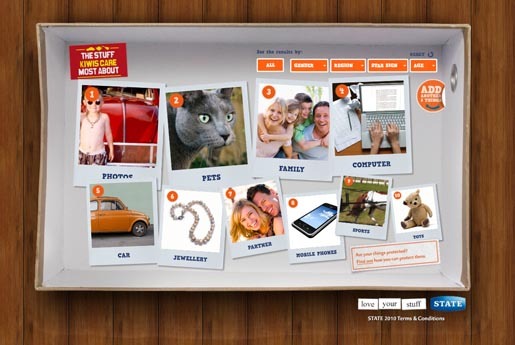 Online at www.my3things.co.nz, the campaign was launched with a television commercial showing New Zealanders placing their favourite things in boxes. The Shoe Boxes campaign was developed at Colenso BBDO, Auckland, by group head David Bowles, executive creative director Nick Worthington, art director Victoria Daltrey, copywriter Will Bingham, agency producer Nigel Sutton and designer Phila Lagaluga, account director Rachel Turner, senior account manager Angela Vance, account manager Katya Urlwin, and planner James Hurman. Filming was shot by director Nathan Price via Capital City Films, Wellington, with director of photography Ian McCarroll and producer Julie Elstone. VFX were produced by Puck Murphy at Perceptual Engineering. Editor was Dave Coulson. Sound was designed at Franklin Road. Music is “My Favourite Things”, adapted from the Sound of Music. The song was﻿﻿ recorded at Franklin Rd by Princess Chelsea, who is working on her debut album for release in 2011.